Whilst politicians have recently been scrambling to take credit for the reopening of the East London overground railway to Dalston Junction they have, unsuprisingly, been silent about the scandal of Dalston Square’s £40million bus stop. Dalston's £40million Slab over the new station which has been built for a planned bus/rail Transport Interchange.There are 9 more tower blocks to be built on the site to sell and pay for The Slab. Despite the public outcry, Dalston’s heritage buildings have been demolished, and its environment is now to be blighted by nine further blocks of flats of up to 20-storeys, all for sale (with no affordable housing) to pay for The Slab . The Slab is a £40million concrete raft over the railway cutting which, we were told, was essential to create a bus/rail Transport Interchange to support the 2012 Olympic bid. 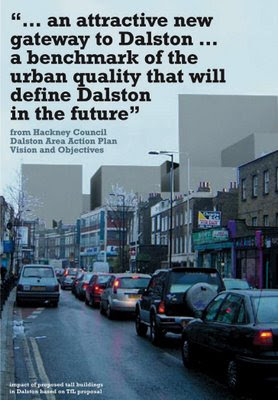 And regenerate Dalston. The new barbarism - the authorities vision for Dalston's future "regeneration"
So there we have it - the destruction of old Dalston’s Town Centre was to finance a £40million Olympic Transport Interchange for use by just one bus that doesn’t even go to the Olympic site (and neither does the train). With schemes of such monumental environmental and financial extravagance, and pointlessness, no wonder our government is bankrupt and the electorate disenchanted. But how could the public have been so mislead? In a culture of official deception just remember that old adage “Don’t believe anything in politics until it's been officially denied”. PS TfL have also said that having the Transport Interchange means bus drivers won’t have to go all the way back to the garage to get a cup of tea. So there’s a comfort. I have no expectation that those responsible will even blush at this outrageous outcome. Those who oppose this kind of project are patronised, marginalised and dismissed by the perpetrators who will now move on to the next project for the 'improvement' of the East End. Adrian Gee-Turner Lib Dem Mayoral Candidate. Earlier today I rang one of the developers who originally was involved in this project and he told me that the spec for the cut and cover was very high as TFL insisted on a sideing in the tunnel as the original plan was to build on top of the tunnel. He also said the where three main reasons why the project went wrong. Lack of leadership to make decisions from the Council, the holding out by Councilors for there slice of the cake and the chaotic organisation of the Council and its own procedures especially its system for compensation on CPO Compulsory purchase orders. I have said elsewhere and will say again, in my administration I will not hesitate for a moment to prosecute anyone steels from Hackney by stealth or overtly.Hackney has really had the brown end of the stick with this and it is not acceptable to just say,..there is nothing we can do. You can expect a lot better under a Lib Dem Mayor. 'Cut and covers' sounds like the tunnel development for the Dalston to Highbury extension. 22 buildings demolished so far and more Hackney millions invested in the 'natural progression' of Dalston Square into Dalston. And now we've got the demolition of Ashwin Street just round the corner. Excuse me while I laugh at 'Adrian's pitch on behalf of the LibDems. We've seen what the LibDems do when in power: they renege on their promises. Take three of the major planks in Nick Clegg's election pitch: scrap Trident, freeze the cuts for one year, don't renew Nuclear Power. All three of these policies have now been ditched. I have no reason to think that a LibDem regime in Hackney Town Hall would have operated any differently. All three parties are wedded to this utter crap about putting 'regeneration' and 'development' into private hands with the most minimal of control from planning. Quite simply this means that local, social needs are stuck into the background or ignored altogether. All we are hearing from 'Adrian' is that he would be somehow magically more efficient than Labour - doing what? Putting a lousy scheme into action? Who cares? That's not the point. The point is that the scheme is lousy because it is a profit-making scheme and not a local development responding to local needs. The main objective when building the slab was not to provide a bus stand, it was to provide a site to construct some of the 22,460 new dwellings that have to be delivered in Hackney as part of the London Plan. A £10m contribution to build the slab came from TfL, from money that was allocated to London Buses. To justify this contribution from a bus transport budget, it could be argued that something should be built that would theoretically enhance the bus network. Maybe the fact that so few buses use the bus turnaround, will be used in the future to justify scrapping the buses all together from the slab and building more housing blocks. Anonymous says that the main objective of The Slab was to provide a housing development site to meet the London Plan's requirement for new homes. 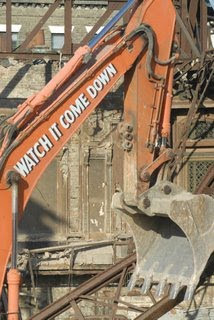 Certainly the authorities used that, and the "regeneration", arguement to justify the demolitions and the public expense. And the cost of The Slab to explain zero affordable housing on tfL's site. But when you read the background papers it is clear the primary driver was TfL's perceived need for a bus facility. That is why it was TfL which commissioned the masterplan for both sites and demanded Hackney release its (demolished) site as part of The Slab funding deal. Lord Low's letter summarises the position succinctly. The full extent of this scandal is still emerging. Erm, the 488 does go to the Olympic site - or at least within easy walking distance of it. Just a small point but may be worth making. As a long-term Dalston resident I must say that although the flats are not great the area is definitely on the up. I don't think a major bus station was ever envisaged. Just wish they would hurry up and open the south entrance to DJ station and redevelop the Dalston Lane/Kingsland Road road junction as it is horribly dangerous - i gather this is now on the cards. They are repaeating the same error in preston. The motive must involve some self interest because the figure simply do not add up. But politics aside, preston has an iconic building that deserves to stand forever. it is an asset even though the manipulated figures say different.